This page contains the Image Upload/Approval Policy for all pictures submitted to the RPG Geek. Make sure you Own your image (scanned, etc). Do Not use images from another site without direct written permission. Any pre-publication images must submitted with the appropriate copyright permission notes. That means direct written permission which is to be included in the caption. Do not upload any image with a watermark - even with permission we don't want them. Images taken from other sites are not to be used unless you get direct written permission (permission is included in the caption - see below). Only upload an image once - you can always link the image in across multiple items but there is never a reason to upload the same image more than once. Do not, however, link images from a personal gallery to an item. Captions are mandatory for images. Something as simple as "Front Cover" or "Sample Page" will do, but it is always better to put something descriptive such as "Front Cover of Special Edition" or "Rare Alternate Cover Art by E. Flibwitz", etc. If you got permission to use the image from the publisher, the permission must be in the caption set off in parentheses... for example: "Front Cover of PDF (used by permission of Steve Jackson Games)". Images must be in normal RGB format. CMYK isn't universally supported by all browsers yet and will be blocked by the upload system. Animated images are not allowed. For PDF products that you own, you are allowed to take a screenshot so long as the resulting screenshot is properly cropped and must adhere to our resolution rules depending on the type of image being submitted (cover, logo, etc). Some people rotate the screens to get the maximum size of the product on their screens. If you need help on taking screenshots of PDFs, post in our forums in the "How-To" section. For PDF screenshots you are allowed to blur out your name in the corner (often added as a watermark for legal PDFs you purchase). If you use a screenshot of a PDF you own, please state so in either the caption or the geekmod notes. If your image is declined, seek out the reason and correct the problem. Do not try to upload again in the hopes it will get through geekmod. Since not all rules can be covered adequately, we reserve the right to judge any image to not be in the best interest of the RPG Geek and remove it. This would be a very rare situation and we hope it never happens. You are not allowed to link images from a personal gallery to a database entry. We welcome both JPG and PNG files. Please note that (due to its lossless compression), PNG serves some purposes better than JPG. Also, please be aware any transparent alpha channel will correctly display at the "original" size of image, but will be converted to black at any other size. Consider converting the transparent areas to an appropriate color (most often white) before uploading. At the Family Level, we are looking for a logo to cover the entire family of games which is usually the logo of the most recognizable game in the family (i.e. for Dungeons & Dragons this might be the D&D 3.x logo). At the RPG level, we are looking for a logo for that specific RPG. At the RPG Item level, we are looking for a front cover scan or a PDF screen-grab. 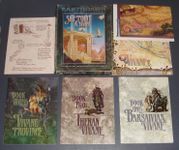 At the RPG Version level, we are looking for the specific cover scan or PDF screen-grab that depicts that version. For many older RPG materials, often the best we can do initially is populate a "well loved" copy of the book. These tend to be worn or torn in spots. For older (out of print) materials this is fine to have as an initial scan in our database. For even older rare/obscure material, it may be that a heavily worn copy is all that is available and so that scan will be particularly useful and probably long-lived. However, when a better image comes along, we want to make an effort to get the better scanned image into our database (all within our image guidelines above) and get it set as the representative image. Note that a larger (i.e. higher resolution) scan is not to be considered better than another scan - so long as the uploader followed our image guideline rules. Any images that don't meet our image guidelines that somehow managed to get through our geekmod process can, of course, be replaced. In an effort to give some guidance on what we consider a better quality image, please look at the following four images (click to expand them to full size). We would like to see replacements in this order. That is, a Heavily Worn copy (with lots of scuffing, rub marks and possible tears) replaced with any of the following: Moderately Worn, In Shrink and Clean (or Mildly Worn). Please note that we prefer Clean to Mildly Worn to something In Shrink - as the shrink tends to cast a glare, change the color tones on the scan and often the price tag obscures part of the cover. If you upload a better scan and it is accepted and set as the representative image for an item or version, please submit a correction to have the older image (i.e. less desirable scan) moved out of the game gallery to avoid confusion. For the one Overall Box Set Contents picture, we ask that you can see the entire covers of all book/booklets but make sure the maps are properly obscured. Look at these three pictures. The first is acceptable, but not ideal. The second picture is the same components from the box set but arranged much better. 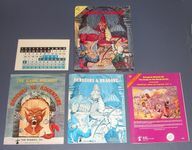 The third image is another ideal shot of box contents (this time for Dungeons & Dragons). If you have an ideal pic to replace a non-ideal pic feel free to upload and explain in your geekmod note why you think your shot is better. If it passes Geekmod, you can submit a correction for the item to have the less ideal picture moved out of the main game gallery (to avoid confusion and similar images). One sample page from the interior of the product (i.e. one representative image from within the book - obscuring tables as necessary). Box Bundled Sets: Front and back cover scans of included rules booklets. Other components should not be scanned (see below). Images should be legible. This means they should be large enough to make out some details and not blurry or badly focused. There is no specific minimum size. NOTE: Overall specific size restrictions on images in Covers and Media were removed on March 27, 2019. Box/Bundled Sets: Do not scan and upload every component of the game. Maps and counters should be partially obscured so they can't be used in actual play but can still be identified. Counter sheets are not to be scanned and uploaded - counter sheets may appear as part of the overall content picture of a box set only. Box/Bundled Sets: Front and back cover scans of rules booklets within these sets may be uploaded. The representative image scan should reflect the product as it appears on the shelf (i.e. box cover, module cover). The illustrated side of a GM screen may be submitted as a single image. Do not show any maps or table/charts/character sheets unless properly obscured so they can't be used in actual play (this rule does not apply if you have permission from the copyright holders and does not apply if the chart is on the outside of the book/package). For cover scans, we prefer actual scans to pictures. Please don't upload a picture unless it's a game that has been in our system for some time without proper scan. If the product is 2 total pages or less (excluding accessories), please obscure the front page by blurring a section - ask a moderator for help if you need it. You do not need to obscure if you get direct written permission from the copyright owner (and put such permission in the description for the item). If you upload a front cover scan for an item without a representative image (the image that shows as a thumbnail to the left of the item), you should go into gallery mode and hit the "More..." button below it. Then select "Propose Representative Image" so the front cover becomes the main representative image. For products that were released in multiple printings (i.e. different RPG Versions within our database], we allow additional cover scans for the other printings provided there is some visual difference. For products that have both a PDF and a physical print book, we allow a screen-grab of the PDF cover as well as a scan of the physical product. The Play gallery should contain shots of people playing a game or shots of the table where the game is being played (e.g. minis on a battle-mat). Please do not use the play gallery to circumvent the rules for pics of components (we do not want scans/pics of every component/counter for the game). The Creative gallery should contain fan art, creative or fun situations involving the game, user painted miniatures that are associated with the entry (do not submit: multiple images of the same miniature, un-painted or miniatures still in retail packaging, miniatures not related to the entry) miniatures used in an in-game situation should be submitted to the "play" gallery. Geekmodders should be more forgiving when things are uploaded to the creative category. The main rule with creative images is that you can't use the creative entry to circumvent the spirit of the other system rules (that is, you can't upload counters or maps or multiple scans of interior pages just by assigning them to the 'creative' category). The logo for the RPG (not a front cover scan of the main rulebook which belongs at the item level). The logo for an RPG line should be cropped from a good quality scan of one of the main books for that RPG. If the RPG line contains more than one RPG (or had a logo that changed), multiple logos may be uploaded to cover them but the representative logo should be the most popular of the set. Geekmodders should be more forgiving when things are uploaded to the creative category. The main rule with creative images is that you can't use the creative entry to circumvent the spirit of the other system rules (that is, you can't upload counters or maps or scans of multiple interior pages just by assigning them to the 'creative' category). If the Periodical contains more than one logo (or had a logo that changed), multiple logos may be uploaded to cover them but the representative logo should be the most popular of the set. Use this gallery for photos of more than 1 member of this Periodical staff. Individual photos should be submited to that person gallery. The icon for any genre should be a free public domain (or suitable creative commons) bit of generic artwork to represent the genre. Please look at existing genre images and follow the examples set. Public domain art, fan art, creative situations involving the genre. The logo for the system, setting, series, family or podcast should be a scan of the official logo from one of the main rulebooks for the game or the official site logo for the podcast (this is usually pulled in via the RSS feed but in some instances may need to be uploaded manually). Public domain art, fan art, creative situations involving the system, setting or series. Actual people/plays should be logged under the appropriate RPG or RPG Item instead. In the case that the entry represents a collective or group, you may upload 1(ONE) photo of each member. Only admins should submit images to these galleries.